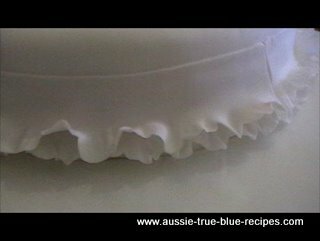 The Garrett Frill is a simple and yet very effective technique, used on Fondant-covered Wedding and Celebration cakes. Before starting with Garrett Frill itself, it is important to prepare the area that you will be attaching the frill to. Depending on the individual design of your cake, you will need to mark a feint line on the surface of the icing using a fine needle or marking tool. To make a Garrett Frill, I prefer to use Fondant. I add a pinch of Tylopur (Tylose) to the Fondant, and massage the fondant with a small amount of vegetable shortening (just a smear)to make it glossy and easy to work with. Roll the fondant very thinly, and using your Garrett Frill cutter, cut out one section. Apply sifted Potato Flour liberally to your fingers, and lay the section over your fingers, working the scalloped edge with a rounded toothpick to encourage a frilled effect. Once all of the scalloped edge has been frilled in this way, apply a thin line of flower glue to the back of the straight edge, and affix to the cake. The fondant will not take very long to dry, because of the Tylose powder that is added. This enables you to adjust the frill over the next few minutes to achieve the desired effect. Please do watch the attached video demonstration for greater clarification.